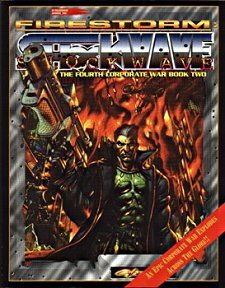 This book covers the second part of the Fourth Corporate War, following on from Firestorm: Stormfront. The war has moved from the initial ocean-based dispute through a conflict between Arasaka and Militech, who'd been hired by opposite sides and ended up fighting each other directly, and now escalates into what is termed the Hot War - a full-on global conflict with tanks ploughing through cities, aerial and orbital bombardments... all the trappings of a conventional war only its corporations who have quarreled, not nation states. There's a quick summary of the first two phases, don't bother with it, get hold of the first volume: it's more fun if the party have seen (if not participated in) the build up to the current point. Like its sister volume, this book is more sourcebook than scenario collection, although you'll find plenty of ideas for how to get your party involved. There's lots of background information, new gear and new skills that may be found of use even if somehow your 'punks manage to stay out of the conflict. It all begins with a timeline and overview of the first month of the war from the standpoint of Lazarus Corporation. Hitherto uninvolved, this massive mercenary corporation has to decide whether or not to jump into the fray. There's a technical briefing covering new equipment and the skills required to use it, even new Roles for those so inclined, and an Adventures chapter packed with ideas and a full adventure. There's also a promise - as yet unkept - of the third volume to cover the outcome of the war. Chapter 1: The Hot War is a collection of material beginning with a report from a Solo of Fortune correspondent (who is, needless to say, as interested in the actual weapons as in who is wielding them!). He describes a 'special operations war' with a series of strikes but no discenable battlefront, claims that both sides' R&D departments are field-testing everything they've got, and predicts hostilities won't end until Arasaka and Militech have bled each other dry. We then move on to a fly-on-the-wall account of a high-level meeting at Lazarus, analysing events so far and speculating on future developments. There's a sidebar on electronic warfare, and others on how the war is affecting the stock market, the effect on global fuel stocks and more. One interesting point is that both parties to the conflict are increasingly relying on Edgerunners hired in. The Lazarus conclusion as to what's going on is rather interesting. We next look at how the world in general is responding, particularly of course nation-states, who hitherto have been the ones to wage war. The stance of other corporations not, as yet, involved is also covered. Next comes an in-depth analysis of the whole background to the war, in particular the underlying emnity between Arasaka and Militech that caused what should have been an ordinary inter-corporation skirmish into all-out war. Next there's a look at likely targets in such a war, along with a world map showing their locations; and profiles of many of the major players. However, all this is a means to an end, to help you create an environment in which your party of 'punks will get embroiled in the war. To this end the next section looks at how Edgerunners are being recruited. If you've run Stormfront they are probably already involved, on one side or the other. It doesn't matter which side they are on, once in there is no discharge whilst hostilities continue. If they are not yet involved, again it doesn't matter which corporation you decide wants them, the process is much the same: they'll either try to trick them, bribe them or blackmail them into enlisting for the duration. Plenty of ideas here on how to sucker them in... And once you have got them, what then? The next section takes a look at how Edgerunners are being put to use, from grunt duty to special ops, and more. Then comes Chapter 2: Technical Briefing. This is an eye-watering array of military hardware as well as new Roles designed for military operations: vehicle operators and pilots. Things Edgerunners don't often worry about, which become more important in the world of special operations (although in one game I ran, the party kept NPC pilots and drivers on retainer). The Panzerboy and the Aerojock await. There's also a PA Trooper, who stomps around in powered armour - and probably reckons that if he can find a suit that will scratch his back he'll marry it! This is followed by a discussion of how the standard Roles fit in to an all-out war. Solos, medtechs and techies in general can find ample opportunity, so can netrunners, particularly those capable of mobile combat netrunning. Fixers will find angles to make money, and medias will find plenty to report on. Corporates and nomads may find fewer opportunities, but they are there if they look. The rest of the chapter contains weapons and other equipment designed with war in mind. There's armour, cyberware, combat-hardened netrunning hardware and software, equipment for the combat medic and more. Then military-grade aircraft and ground vehicles galore, as well as loads of drones and other remotely-operated devices, and powered armour. Some material is reproduced from Maximum Metal for ease of use. There are rules for vehicle combat, and notes on urban fighting, threat levels and security rathings. These help you decide appropriate challenges... or could be something for the party to research before attempting a raid. Next we find out about the troops maintained by Arasaka and Militech. Useful intel here, whichever (if either) side the party is on. Added to this is the standing troops in North America, who may get involved when fighting rolls over into areas they are sworn to protect. We then have rules for conducting squad-level combat, and an introduction to what happens when the battlefield is enhanced - or infested, depending on your point of view - with combat netrunners. Finally, Chapter 3: Hot War Adventures provides a wealth of ideas for involving the party, even if (at the outset at least) they don't want to actually get involved. There's a detailed timeline of the first few months, which could provide snippets of newscasts for them to hear. This is followed by information on the war's effect on ordinary life. That will impact on your 'punks wherever they happen to be in the world, in the Net or even on orbit. There's advice on refereeing a war situation, and plenty of ideas for missions to give those characters who have enlisted (willingly or not) with either side. This, of course, includes the likely responses of whichever government thinks it has jurisdiction over wherever the mission takes place. And there's plenty for those who've decided their best bet is to stay out of the war... and not solely confined to ensuring that they get mixed up in it anyway. There is a collection of locales for events to take place - a mobile supply centre, an apartment block, a corporate enclave, a corporate tower, a munitions factory - all with ideas for attacking, defending or just being in the wrong place when an attack goes down. Then comes the endgame of the war, when governments finally take action. This leads on to a full-blown adventure scenario that puts your 'punks right in the middle of events. Will they help bring the war to a close? Or will they destroy any chance of a peace? All this in under 150 pages. It's amazing just how much material is here. If you want to bring war to the mean and chromed streets, this book will facilitate the mayhem. Return to Firestorm: Shockwave page.